I PURCHASED THESE PRETTY EARRINGS MANY YEARS AGO AT AN ANTIQUE SHOP. 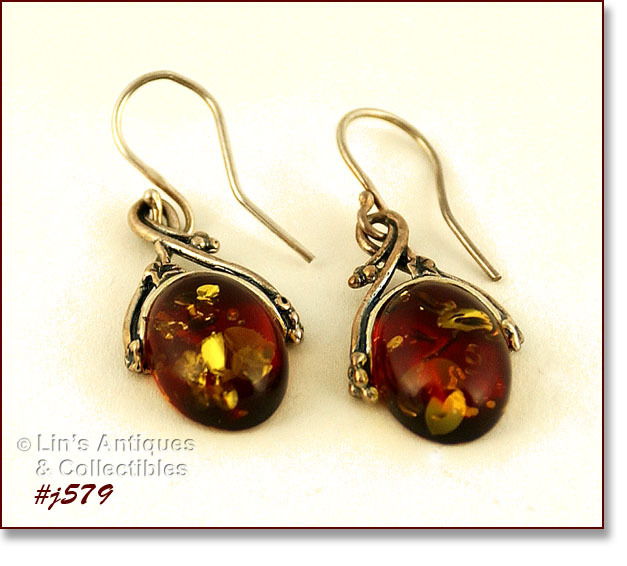 THE WIRE IS MARKED 925 AND THE SETTING APPEARS TO BE GLITTER LUCITE (ACTUALLY LOOKS LIKE RED AMBER). THE DANGLE MEASURES 1 1/8” X 5/8” – VERY NICE! 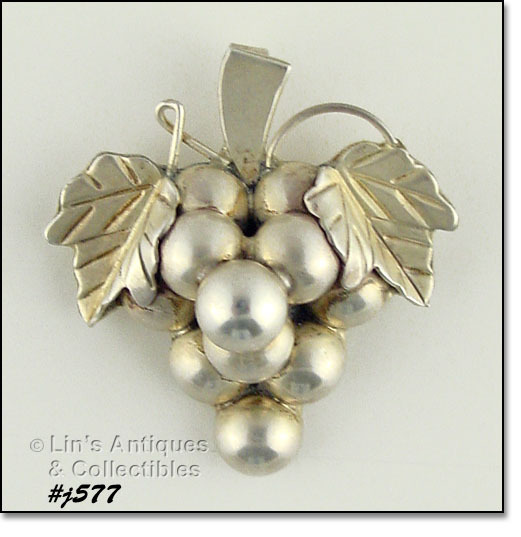 THIS LISTING HAS A GORGEOUS SILVER GRAPE CLUSTER PIN/PENDANT! IT MEASURES 1 ¾” LONG (AT LONGEST), 1 ½” WIDE (AT WIDEST), AND IS MARKED 925, MEXICO. EXCELLENT CONDITION! 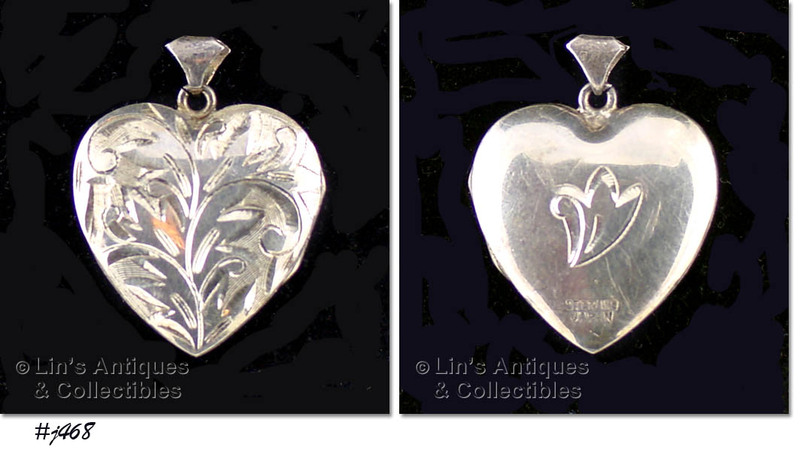 THIS IS A VERY PRETTY HEART SHAPED LOCKET! IT HAS MARCASITES ON FRONT, MEASURES 1 ½” LONG (INCLUDING BALE), 1” WIDE (AT WIDEST), AND IS MARKED 925. NICE! THIS LISTING HAS A VERY PRETTY NECKLACE AND EARRING SET! 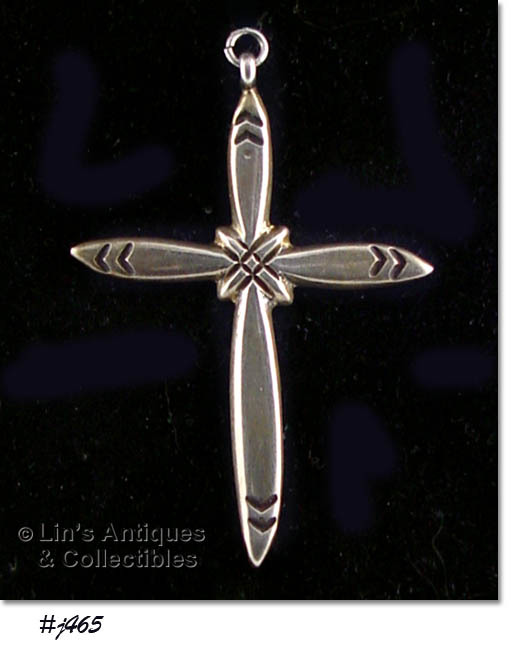 THE PENDANT MEASURES ½” WIDE, ¾” LONG (INCLUDING BALE) AND IS ON A 16” CHAIN. 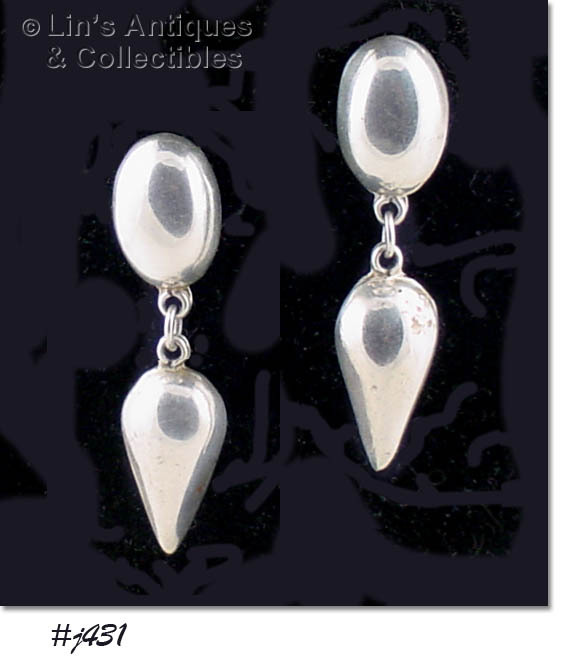 THE EARRINGS ARE PIERCED DANGLE STYLE WITH THE DANGLE MEASURING ½” LONG, 3/8” WIDE. THE EARRINGS AND THE PENDANT HAVE MARCASITE ACCENTS AROUND A DARK STONE (COULD BE SAPPHIRE OR ONYX – IT’S VERY DARK SO I CAN’T BE CERTAIN). THEY ARE MARKED 925, CHINA. THE NECKLACE (CHAIN) IS MARKED 925, ITALY. LOVELY SET THAT WOULD BE AN EXCELLENT GIFT! THIS STERLING LOCKET IS SO PRETTY WITH LOTS OF ETCHING ON THE FRONT AND A SINGLE FLOWER ON THE BACK! MEASURES ¾” X ¾” AND BACK IS STAMPED: STERLING, JAPAN. THERE ARE TWO PHOTOS INSIDE – ONE IS A GIRL, THE OTHER IS A YOUNG MAN IN MILITARY UNIFORM – I WOULD GUESS IT TO BE FROM THE 1970’S. THERE IS NO DISCOLORATION ON THIS LOCKET, IT’S NICE AND SHINY (PHOTO HAS SOME LIGHT REFLECTION). 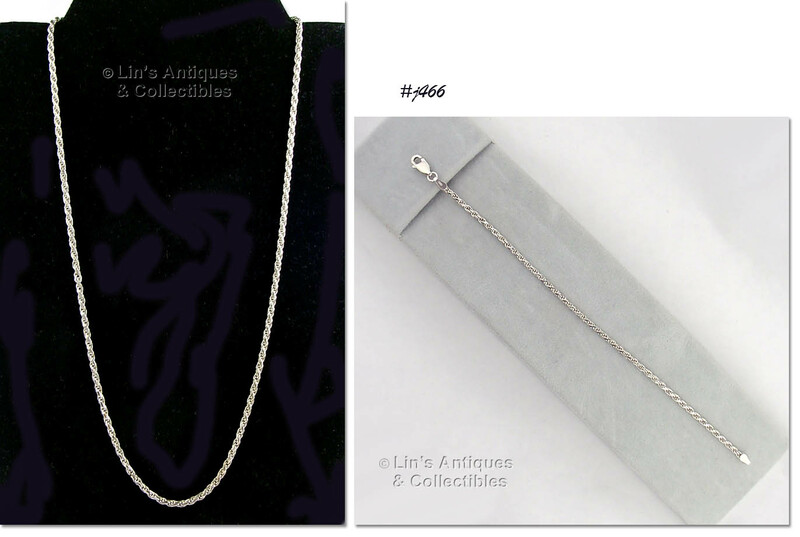 EXCELLENT CONDITION SILVER NECKLACE AND BRACELET! THEY’RE ROPE STYLE AND ARE MARKED ITALY, 925. NECKLACE IS 18” LONG, BRACELET IS 7” AND BOTH HAVE LOBSTER CLAW CLASPS. SUPER! 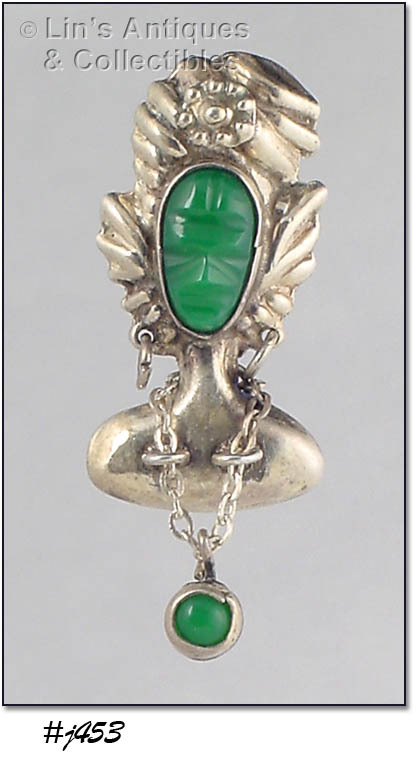 THIS IS A NEAT PENDANT! 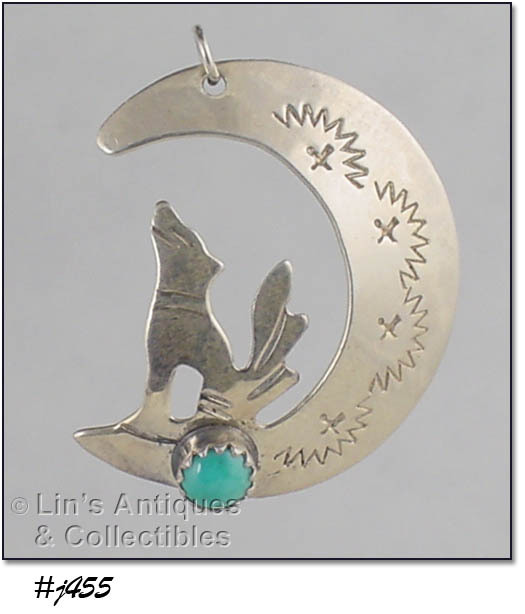 IT’S SHAPED LIKE A CRESCENT MOON WITH A HOWLING COYOTE. MEASURES 1 ¼” X 1 1/8” AND IS MARKED: K.F., 925. 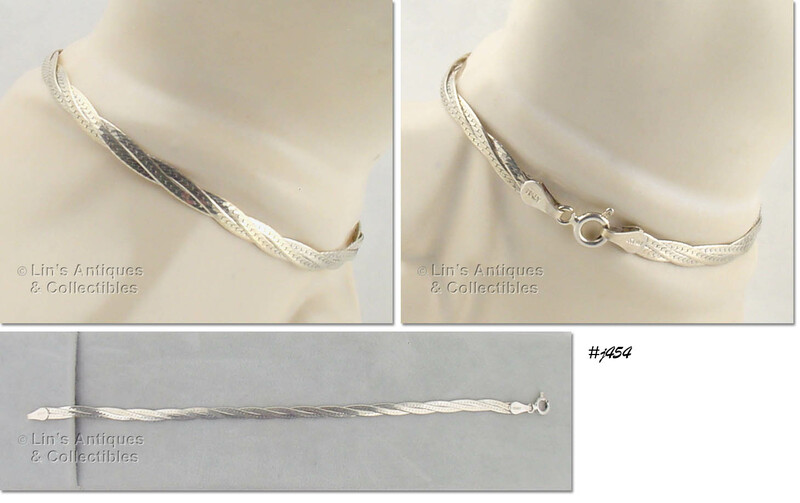 THIS IS AN ATTRACTIVELY STYLED STERLING BRACELET – IT’S BRAIDED! MEASURES 6 ¾” LONG, 1/8” WIDE, MARKED 925, ITALY. EXCELLENT CONDITION! LOTS OF DETAIL ON THIS PIN! SHE HAS A FLOWER IN HER HEADDRESS, WEARS HOOP EARRINGS, AND HAS A NECKLACE! BACK IS STAMPED STERLING, 925. MEASURES 1 ¼” X 5/8”. EXCELLENT! VERY PRETTY SILVER PIN WITH A 4-LEAF CLOVER AND ACCENTED WITH PIECES OF ABALONE SHELL! PIN MEASURES 1 ½” DIAMETER, BACK IS STAMPED: HECHO EN MEXICO, ALPACA. GREAT ITEM! VERY PRETTY NECKLACE WITH SIMPLE STYLING THAT LOOKS EQUALLY LOVELY WITH A SWEATER OR A BLACK DRESS! STERLING CHAIN MEASURES 24” LONG AND IT HAS 9 STERLING BEADS. LOVELY! VERY PRETTY, SHINY SILVER BRACELET! THIS IS HERRINGBONE STYLE AND IS STAMPED 925, ITALY. MEASURES 6 ¾” LONG AND IS 1/8” WIDE. 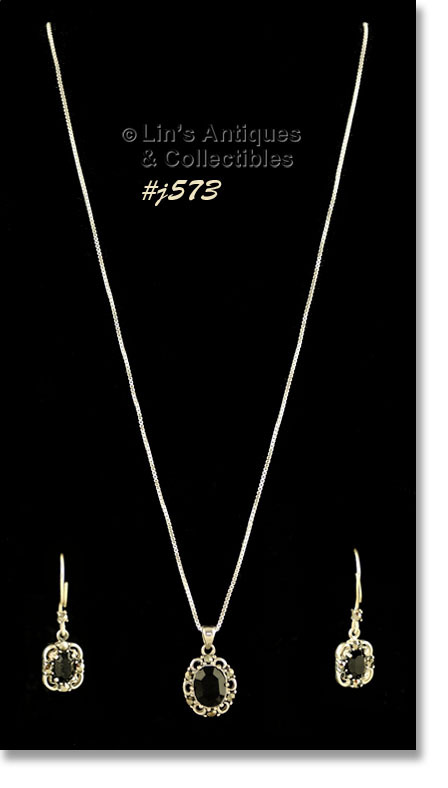 THIS IS A LOVELY NECKLACE THAT WOULD LOOK GREAT PAIRED WITH OUR EARRINGS IN #J431! 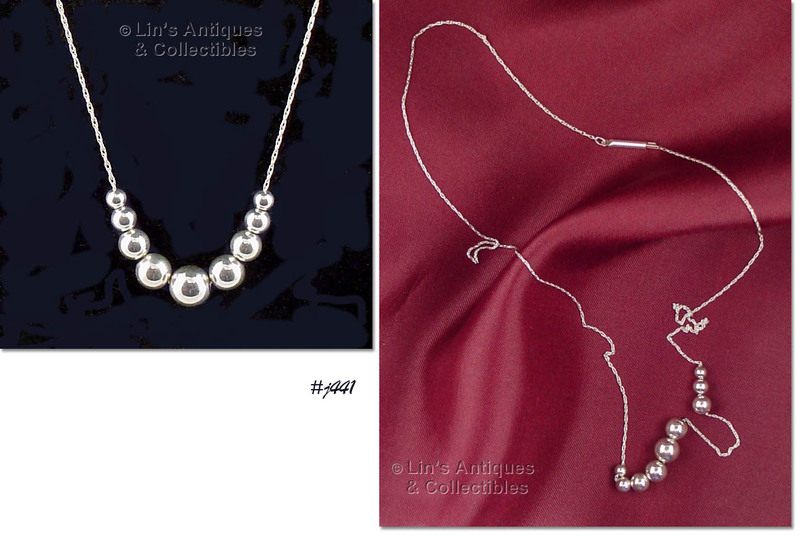 NECKLACE IS REFERRED TO AS “LIQUID” SILVER BECAUSE IT’S MADE OF TINY SILVER TUBES ON 5 STRANDS. MEASURES A TAD OVER 24”. THESE EARRINGS ARE UNUSUAL! THEY’RE ROUND SHAPED (MEASURE ½” DIAMETER), AND HAVE A PRETTY HORSE DESIGN UNDER WHAT APPEARS TO BE LUCITE. 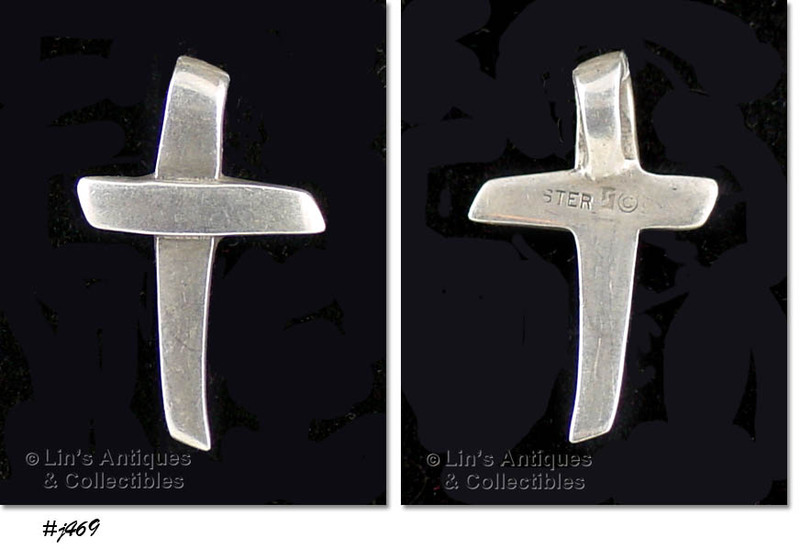 EARRINGS ARE SCREW BACK STYLE AND ARE STAMPED “STERLING, AMCO”. VERY NICE! NEAT RETRO ITEM! THIS IS A STERLING NECKLACE WITH STERLING INITIAL “L” PENDANT. NECKLACE AND PENDANT ARE STAMPED 925. PENDANT HAS MARCASITES FOR ADDED SPARKLE. 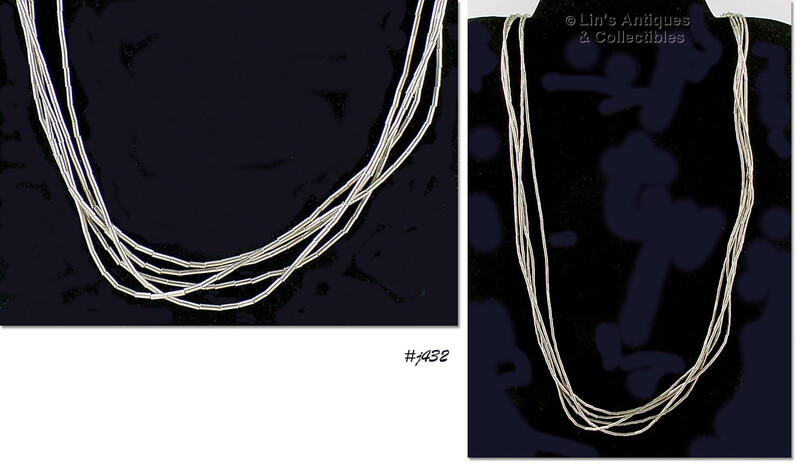 NECKLACE MEASURES 18”, PENDANT IS 1 ¼” LONG (INCLUDING BALE) AND 5/8” WIDE (AT WIDEST). PRETTY!